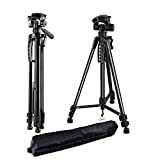 – The Tripod Set on 3x extendible legs with rubber feet for improved grip on rough terrain, offers continuous adjustment of the central column height, along with a 3D tilt head for setting up the camera at a variety of angles and perspectives to achieve the shot you want. This entry was posted in Discount Photography and tagged 157cm, Aluminum, Camera, Camera/Camcorder/DLSR/Video, Carry, Case, Digital, Lightweight, Travel, Tripod by Ball Photo. Bookmark the permalink.